Is it worth going large with Sony's latest handsets? 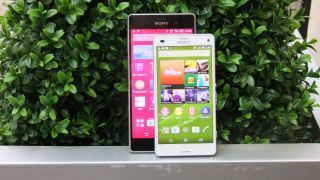 The Xperia Z3 goes up against the Z3 Compact. Who wins? Sony's latest flagship handset, the Xperia Z3, is here and not only is it an excellent smartphone, but it also launched alongside the Xperia Z3 Compact, a scaled down variant that packs almost the same level of power into its smaller frame. The Xperia Z3 Compact shows Sony is serious about compact handsets because despite its smaller stature and lower price, the Z3 Compact doesn't make too many compromises, which means choosing between the two isn't quite as straightforward as it first appears - is cost important? What will you lose by downsizing? Don't worry though - we've put them to the test and decided which is worth your hard-earned dollarpound. The biggest difference between the Sony Xperia Z3 and the Z3 Compact is the screens of the two devices. The Xperia Z3 rocks a 5.2-inch full 1080p display, giving the Z3 an impressively sharp and vibrant pixel density of 424ppi (pixels per inch). Despite its name, the Z3 Compact isn't exactly small with a 4.6-inch screen - still a very reasonable size (especially if you're coming from an iPhone), although the resolution takes a hit along with the smaller dimensions, with a 720 x 1280 display, leading to pixel density of 319ppi. The lower density means that the image quality isn't quite as sharp as the Z3, but that really doesn't mean the screen is terrible to look at. Actually, Sony made the right choice about going for a lower resolution with the Z3 Compact. When browsing websites graphics and text are displayed well, and if the resolution had been any higher on the smaller screen it might have made it a little too uncomfortable to read. One thing I did notice when placing the Xperia Z3 and the Z3 Compact side by side was that with images and webpages with white backgrounds, the Z3 Compact has a slightly blue hue, giving a cooler (in the temperature sense) look, where the Z3 has a more accurate white level. Overall, if you're going to be doing a lot of gaming, watching movies and browsing the internet, then you'll appreciate the Z3's larger size and higher resolution, but if you don't fancy the large 5.2-inch display, the Z3 Compact's screen still does a very decent job. One of the most interesting features of the Sony Xperia Z3 is PS4 Remote Play, so it's good to see that Sony has seen fit to include it with the Xperia Z3 Compact as well. This feature allows PlayStation 4 owners to stream games from the console to the Z3 or Z3 Compact via their home network, and if that feature sounds good on paper, the good news is that it works very well in practice on both smartphones. Because the process basically uses the PS4 Remote Play app to stream the game content, similar to how the Netflix app streams movies, the differences in hardware between the Z3 and the Z3 Compact do not affect remote play. Instead, the only difference between the two handsets boils down to the screen; if you want to stream PS4 games in full 1080p resolution on a larger screen, then the Z3 is the clear winner. That doesn't mean that games streamed to the 720p screen don't look impressive, and if you go for the Z3 Compact you'll still get a very good Remote Play experience, but for wow factor alone I have to hand it to the Z3. As with previous products in the flagship Xperia Z range, both the Xperia Z3 and the Xperia Z3 Compact are rated at IP65, meaning that as long as all the flaps cover the various ports of the devices, they are dust tight and protected from " low-pressure jets of water from all practicable directions", which is good news if you accidentally wander into a car wash. Both handsets are IP68 rated as well so they can be kept under 1.5m of fresh water for up to 30 minutes. Having that level of robustness on an expensive flagship device such as the Z3 is great, especially when it doesn't affect the stylish aesthetics either, and the fact that Sony has brought the same level of protection to the cheaper Z3 Compact is also commendable. This means that if you're just after a water and dust-proof smartphone and little else, the Z3 Compact is an excellent choice as it offers a cheaper cost but is no less rugged. The Xperia Z3 and Z3 Compact both sport similar forms, but underneath that the biggest differences between the handsets can be found. Both phones feature what Sony calls its OmniBalance design, which is supposed to make the handsets look good no matter what angle you're looking at them from, as well as feeling comfortable to use whichever way you hold them or what tasks you're performing. Because of the smaller size and lighter weight of the Z3 Compact (which I'll talk about more in a bit), OmniBalance works best with the smaller smartphone. It really does feel comfortable in the hand as you use it to make phone calls, play games, take photos and more. The larger and heavier Z3 by contrast isn't quite as comfortable to hold, especially if you have smaller hands, leaving the handset feeling less versatile than its smaller sibling. This leads me on to the biggest differentiator between the Xperia Z3 and the Xperia Z3 Compact: size and weight. The big 5.2-inch screen of the Z3 necessitates a similarly large body, with dimensions of 146 x 72 x 7.3 mm and a weight of 152g, meanwhile the Z3 Compact's dimensions are a fair bit smaller at 127 x 64.9 x 8.6 mm with a weight of 129g. This means there's a pretty stark difference between the two handsets, and it's one that could help you make up your mind when choosing which handset to go for. Elsewhere the design of the two handsets is very similar, with both sporting glass backs and fronts and plastic sides that give the phones a bit of extra protection when dropped, which means both are very good looking devices. There's no doubt that the 5.2-inch screen of the Z3 is lovely, but it makes the whole phone rather large with some parts of the screen difficult to reach if you're using it one handed, and the extra size and heft of the handset will certainly not go unnoticed, especially if you carry your smartphone in your pocket. The Z3 Compact has no such issues so if you're after a phone that's powerful yet small enough to carry around with you and use one handed, then the Z3 Compact is definitely the handset to go for.